Ultraviolet irradiation is capable of affecting skin surface lipids, especially squalene and cholesterol, both in vitro and in vivo, with generation of active lipoperoxides. The photodecomposition of the skin lipid component was carefully evaluated by capillary gas-chromatography. The effects of UV-induced lipoperoxides on human keratinocytes in culture and on guinea pig ear slices were compared with those of synthetic lipoperoxides, i.e. cumene hydroperoxide and 13-hydroperoxylinoleate. A time- and dose-dependent effect on protein synthesis and mitotic activity was observed. In cell culture low concentrations (0.05–5 Μg/ml) of peroxidated squalene and synthetic lipoperoxides stimulated the incorporation of radiolabelled thymidine and phenylalanine, while higher concentrations (>10 Μg/ml), or longer periods of treatment, induced cellular damage. In guinea pig ear slices, the lipoperoxides (5–50 Μg/ml) increased aminoacid incorporation and the number of epidermal pigment cells; higher concentrations (>100 Μg/ml) caused a derangement of epidermal structure. 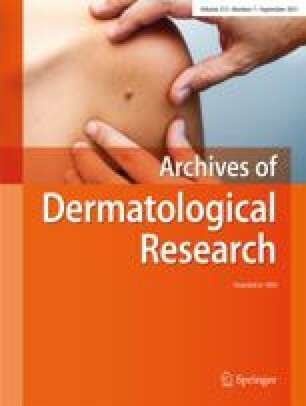 The results suggest that UV irradiation of skin generates lipoperoxides from the surface lipids which, in vitro, are capable of producing a number of changes in epidermal cells.